Sometimes you just have to be in the right spot at the right time. I credit Murbachi, the intrepid 3D photographer, with being in the right spot at the right time this past week. While creating a 3D photograph journal of the North Towers of Uncertainty area, he found this hitherto undiscovered (by me at least) stone and cement dam. That was part one, being in the right spot. Part two was the right time. 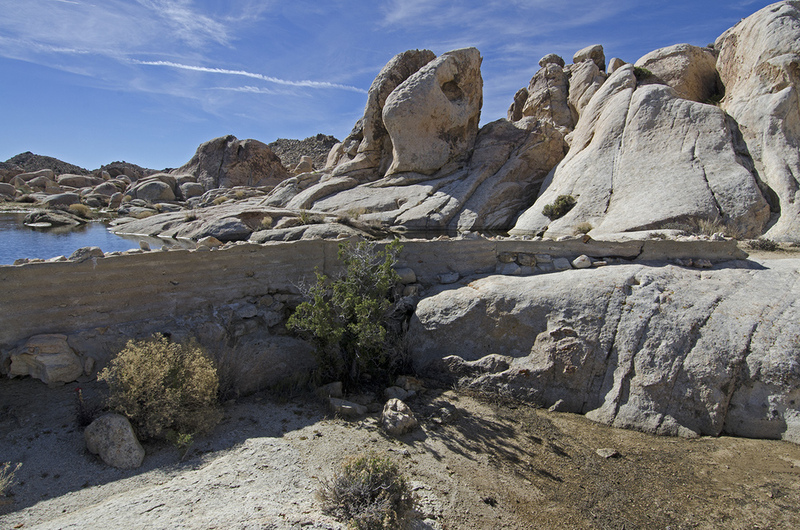 J Tree had received a couple inches of rain a few days before his visit, resulting in a substantial amount of water behind the dam. He sent me a photo of the pond, late at night upon his return home, knowing I would see it in the morning and immediately attempt to clear my schedule to visit the spot for myself. I needed to head out there before the water evaporated, to see what I could find. This might be a once-in-a-lifetime opportunity. 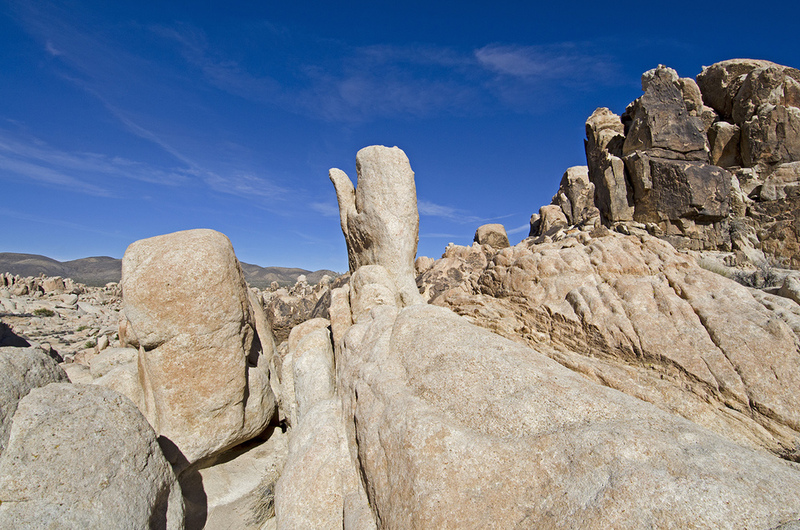 Click HERE to visit his website and view some great 3D images and video. And as my luck would have it, I was able to head out a couple days later. What made this trip so exciting was, I could find no information whatsoever about this dam tank. It wasn't listed on any of my maps, nor mentioned in any of my guidebooks and unknown even to two Park Rangers I talked with. 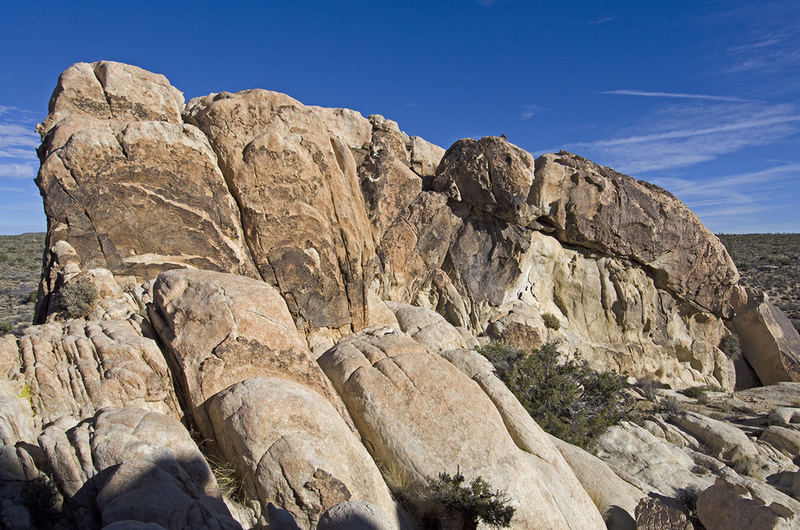 All of which amazes me as it's located less than a 1/4-mile from the California Riding and Hiking Trail, and less than 3/4-mile from the Geology Tour Road. Which is why I've decided to call the spot, "Surprise Tank." I arrived at one of the small parking areas established for the California Riding and Hiking Trail around 8:30 am and there were already 4 cars in the small lot, as it's a popular trail. 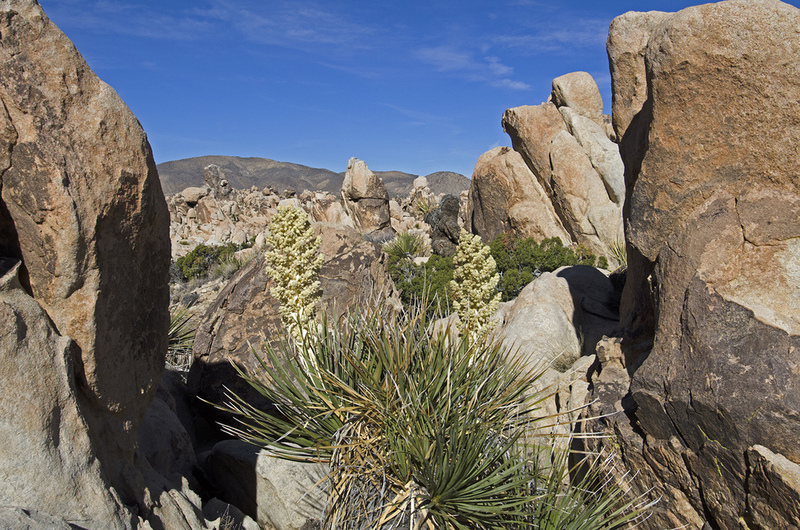 I quickly gathered my gear together and commenced hiking southwest along the trail. I'd never hiked any of this trail before, but enjoyed the short portion I used. 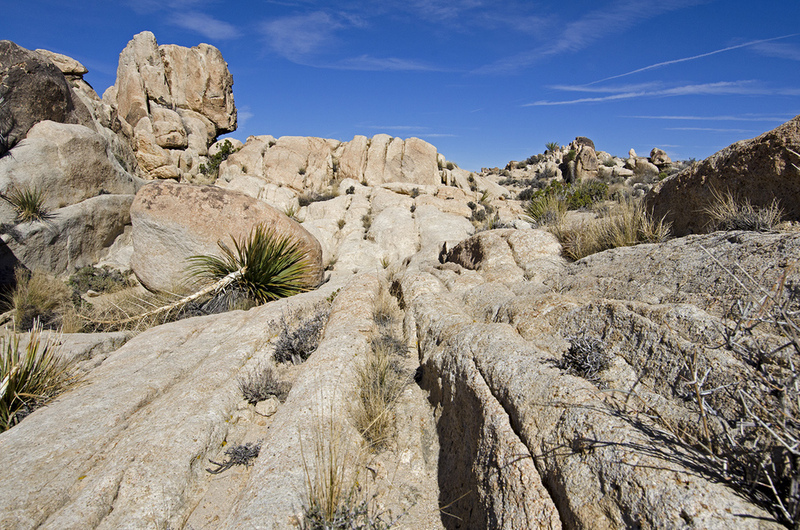 I've decided to eventually hike the entire thirty-five-mile-long trail at some point, probably in three or four stages. 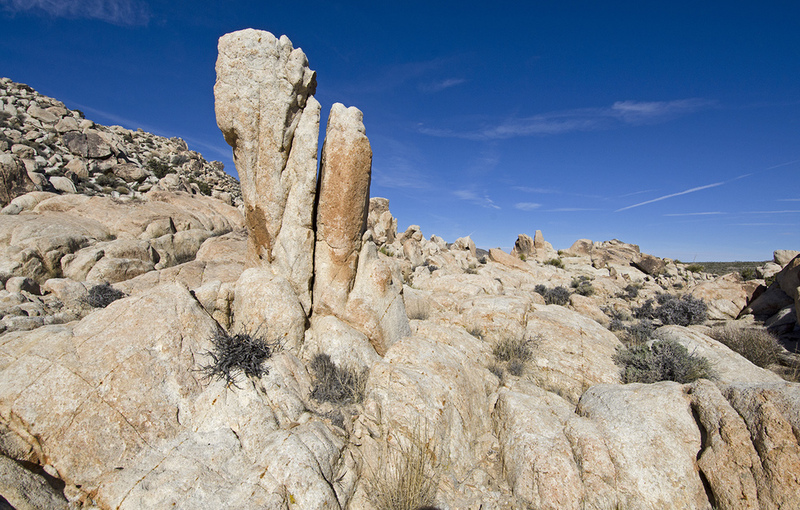 One end is located at Black Rock Campground, the other end near the Ranger station at the North Entrance. 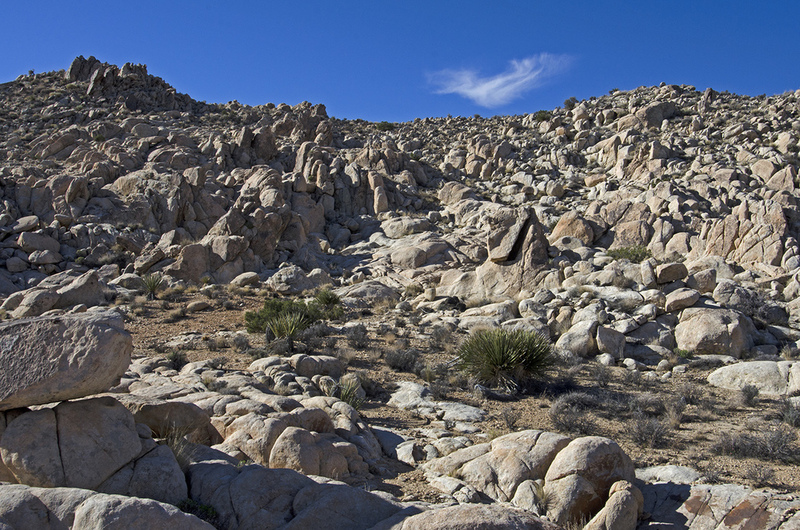 I could see the general area of my destination almost from the start of the hike, it's that jumble of boulders almost directly in the middle of the photo above. About 1/3-mile in, this wash veered off the the left of the trail. As it appeared to be heading in the direction I wanted to go, I veered as well. It then sorta veered a little off compass, so I left the wash and headed to where I thought I needed to go. And it wasn't long before I caught my first glimpse of the dam. Now that I had spotted it (it's almost dead-center in the rocks), there was no more veering. Except around cacti. 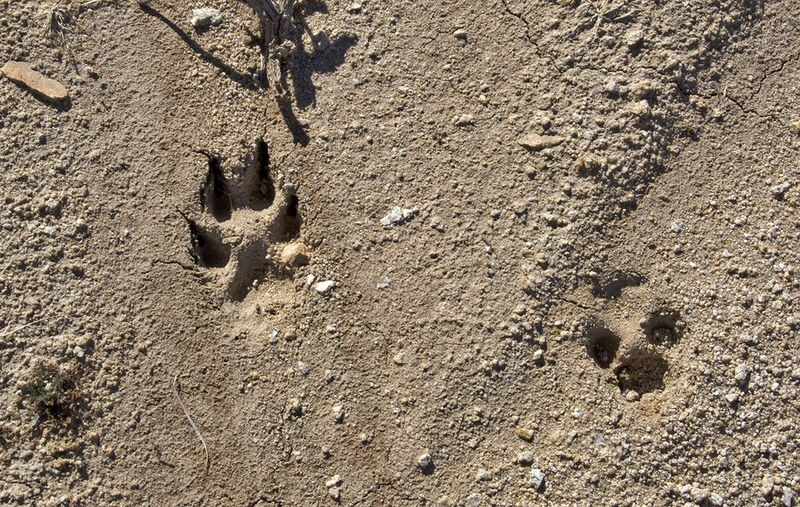 I kept looking for any evidence of ranchers or miners as I walked along, but only saw one small piece of rusted sheet metal. I don't think there was any permanent residence out in the area, but you never know. Here's a better view of the dam. Who built it? My guess is cattle ranchers, and when you talk about ranchers, my next guess would be that Bill Keys may have had a hand in it. It's not that far from the Desert Queen Ranch. The dam stands about four feet tall and is roughly forty feet long. 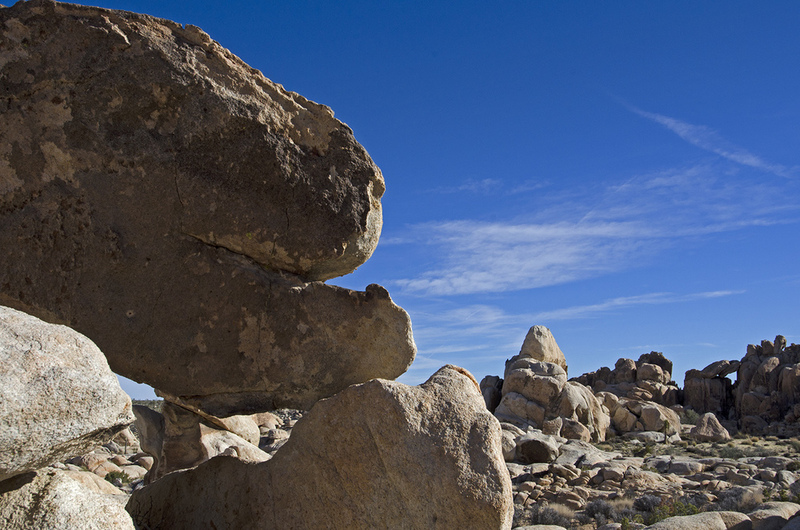 It's a bit of a zig-zag, probably to make use of the boulders on either side. I couldn't find any hand impressions or writing in the cement anywhere along the dam, so no clues there. There's a small catch basin in front of the dam, where the juniper is happily drinking in moisture from the sands below. You can see a bit of cement and stonework directly in front of the juniper. Ok, now it was time to take some pictures of the pond/pool. I'm still amazed at how beautiful this spot is, out in the middle of Queen Valley. The water really hits the spot. I spent quite a while walking around the water, enjoying the peace and serenity. The only thing I heard was my boots on the ground and birds tweeting off in the distance. A light wind rippled the surface of the water. It was desert quiet. You can't really ask for a much better day than that. 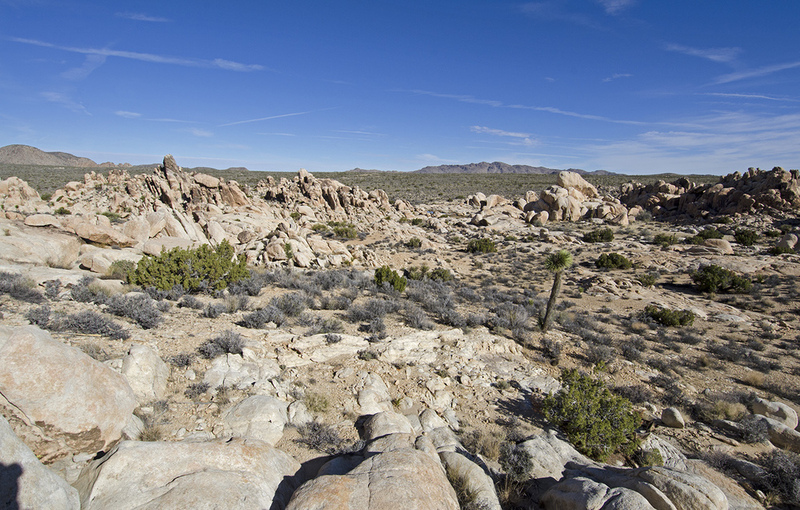 After a short rest and some crackers, I decided to explore the surrounding area, to see what I could find. I found a lot of rocks. 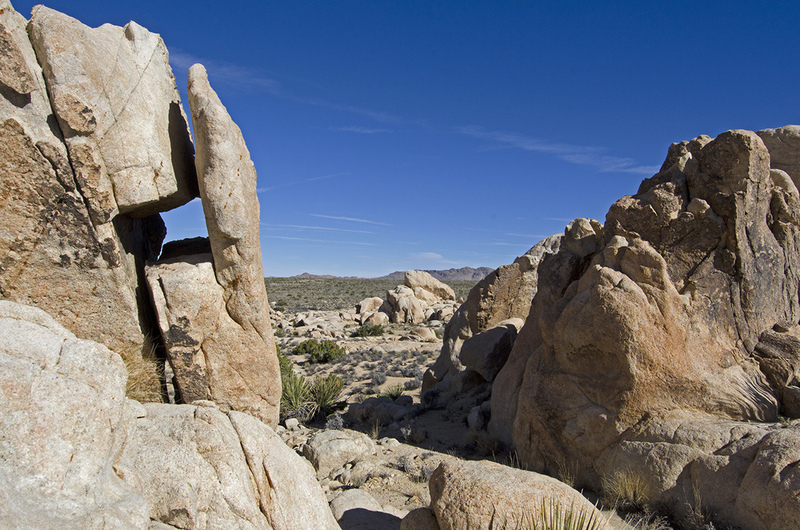 "Of course," you'll say to yourself, "Joshua Tree is full of rocks." And you'd be so right. 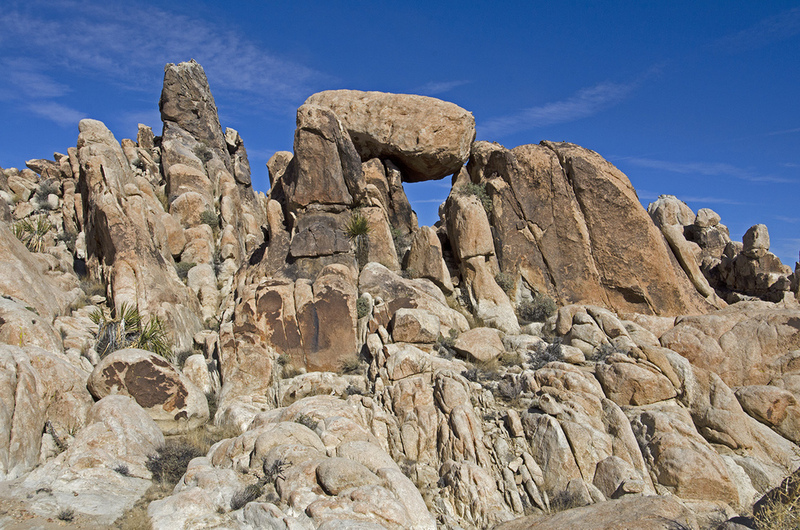 But this little spot in Queen Valley has some of the most interesting, unique and photogenic rocks as I've seen in J Tree. Do you like spires and towers? 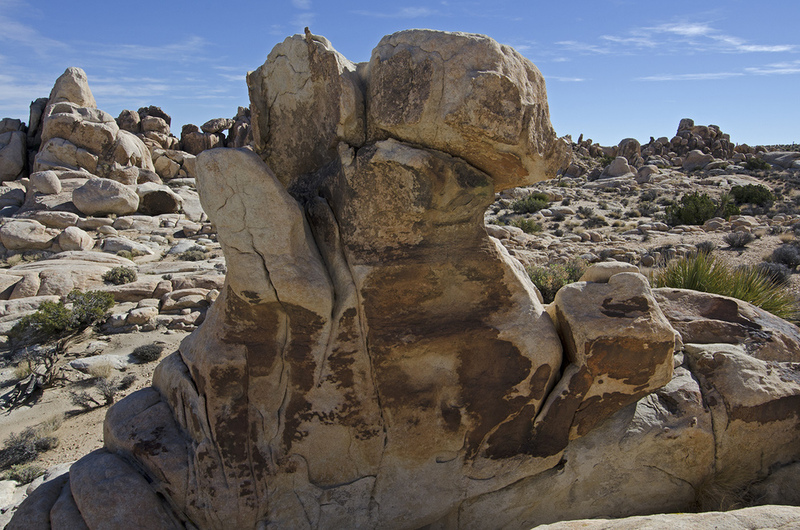 How about rocks that look like animals, people, or a hidden door that could lead into the depths of the earth? Strange patterns and dikes, spheres and overhangs. This area is fascinating. 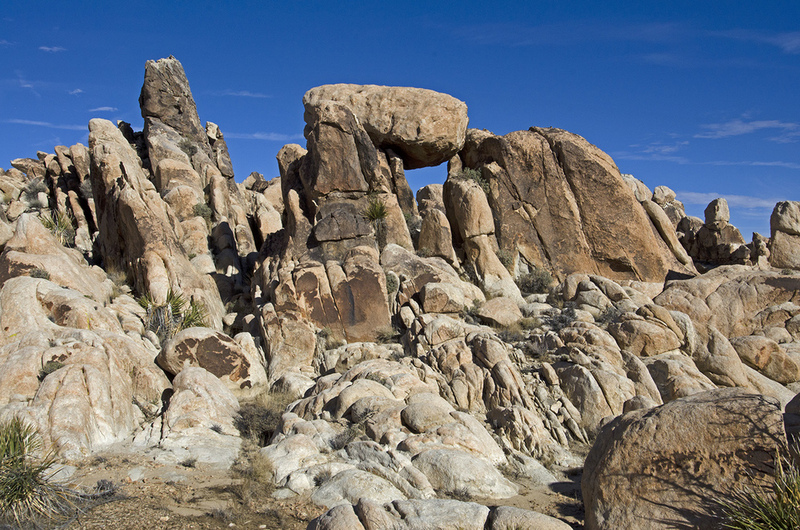 If you enjoy the oddness of J Tree's granite boulders, you'll love this wanderland around Surprise Tank. I took a LOT of pictures during the two hours or so I rambled about. Here are some of my favorites. 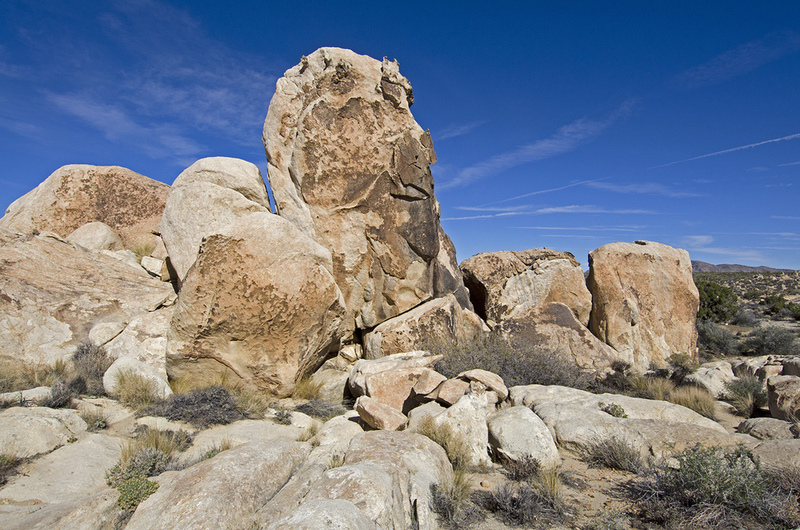 When it came time to head back to the truck (as there were a couple other quick stops I wanted to make before heading home), I thought I would check out a large, balanced boulder that Murbachi had told me was almost directly in line with the path I would be taking cross-desert back to the parking area. 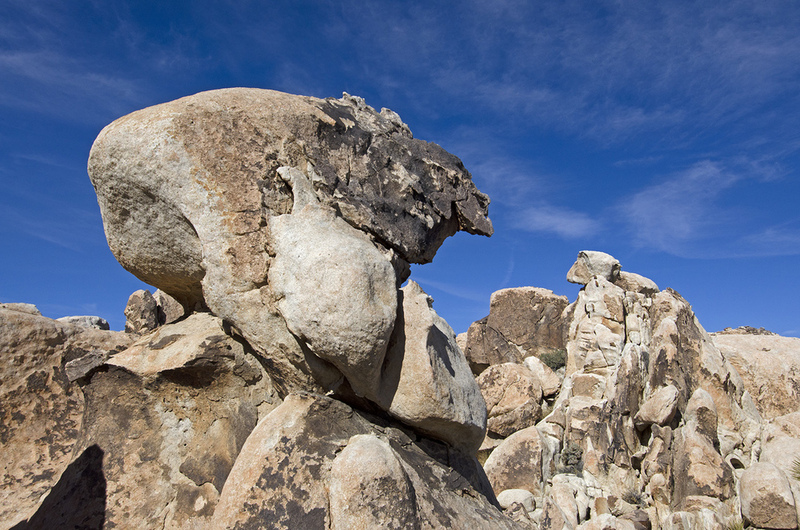 Can you see the balanced boulder? 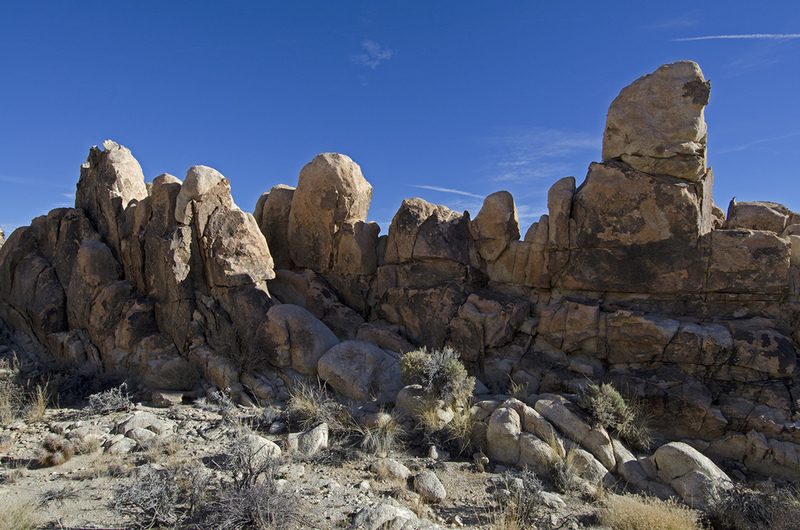 A long stretch of exposed rocks leads right to it.